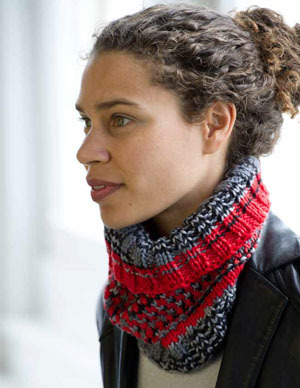 From One + One, this wonderful wimple knitting pattern from Annie Modesitt shown above in 299 Red and 148 Grey Tonal, uses only one color at a time, but in a slip stitch pattern that mimics a more complicated type of intarsia design. The piece can be worn many ways - as a hat with the ribbin over your brow, as a headband, or, as shown above, as a turtleneck cowl. 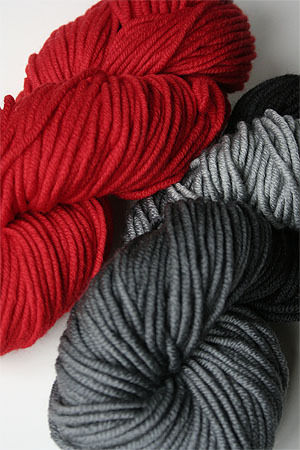 In Ultrabulky from Artyarns, it is super squishy and soft merino wool, so any way you wear it, you'll adore it! Or make your own combo!